Great news!! Effective Nov 16, 2017, we are removing the 2% surcharge on T-Mobile refills. We have closed a special deal with our providers allowing us to pass on some savings to you, our beloved customers. T-Mobile To Go Prepaid (PAY AS YOU GO) has great rates and popular phones like the Sidekick II. The Sidekick pricing plan is a great deal, especially for teens. For only a $1 per day subscribers receive unlimited email, web browsing, instant messaging and text message, and can make calls for $0.15/min. Get unlimited e-mail, Web browsing, domestic instant messaging, and domestic text messaging for $1 per day, and spend only $0.15 per minute for nationwide calls. Domestic LD: Included. No roaming charges. International calling: In over 150 countries (see provider for more details). Gold Rewards: Once you've added $100 refills to your account, subscriber automatically becomes a Gold Rewards customer and receive at least 15% more mins with every succeeding $10, $25, or $50 refill cards and minutes do not expire for 1 full year. Gold Rewards does not apply to Sidekick® use. **The $100 refill value already includes the 15% bonus minutes in the 1000 minutes that you will receive. Hence, there will be no more additional 15% to the 1000 minutes. Shelf Life: These T-Mobile To Go refill cards have a shelf life of 90 days. This means that you may wait up to 90 days from the date of purchase from us before loading it onto your prepaid phone. The actual airtime minute expiration will start only on the day that you load it on your phone. Extended by Refill: If subscriber refills their account before the expiration date, their minutes will extend to the new expiration date. 411 Connect is also available. T-Mobile number is required to be provided in the shopping cart, and minutes will be directly loaded to the provided T-Mobile number. T-Mobile To Go is a very competitive prepaid cellular option. With T-Mobile's Gold Rewards program, customers can get rates as low as 10 cents per minute with 1 year expirations on each refill. 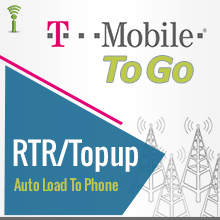 TMobile also offers roaming at no additional charge and additional features such as text and picture messaging, instant messaging, and free cellular access to a selection of internet news sites, and more. As such, T-Mobile To Go is a great option for even the most tech-oriented consumers, especially as their selection of phones and special features broaden. And, of course, for those who just like to talk, 3-way calling, caller ID, call waiting and voicemail come standard. For Sidekick users, T-Mobile also offers a Sidekick To Go program, which allows anyone to use the T-Mobile Sidekick mobile messaging device for unlimited web access, picture mail, instant and text messaging for a mere dollar a day. Voice calling on this plan is a flat 15 cents a minute. Thus T-Mobile To Go is a great prepaid service, whatever your "geek level," making good their no-fees "Get Prepaid Without Getting Burned" and their overall "Get More" promises with aplomb. And if you don't like their prepaid phone selection, you can always grab an unlocked or T-Mobile phone and have fun! T-Mobile To Go Refill Minutes: Compatible with all T-Mobile To Go PAY AS YOU GO Prepaid Wireless plans (T-Mobile Prepaid, FlexPay or kidConnect). If you are uncertain as to what type of T-Mobile To Go Refill Minutes Plan you may have, please call our professionally trained customer service representatives toll-free at 1-877-6-Get-PIN (1-877-643-8746) from 10am to 10pm EST 7 days a week or visit our Wireless Prepaid FAQ section or Email us at [email protected]. The T-Mobile To Go® logo and the T-Mobile To Go® product images are registered trademarks of T-Mobile To Go®. CallingMart is in no way affiliated with T-Mobile To Go® or any other entity for which a logo or name may be present. CallingMart refers to these logos and or names solely for the purpose of demonstrating the products and or services that it resells. - For technical assistance, please call 1-877-778-2106.